Indoor Herb Gardens have always been popular. Where you have a few clay flowerpots sitting on the kitchen windowsill or on a kitchen counter top, but with this DIY project you can have a full array of herbs. This herb garden is perfect for anyone who may have a limited space indoors or outdoors. Hang next to a blank kitchen wall where you have easy access to these flowerpots and the herbs inside. How convenient to have them for cooking. Maybe you live in an apartment where indoor space is limited. Then hand this pot rack on a balcony where you can access them easily. 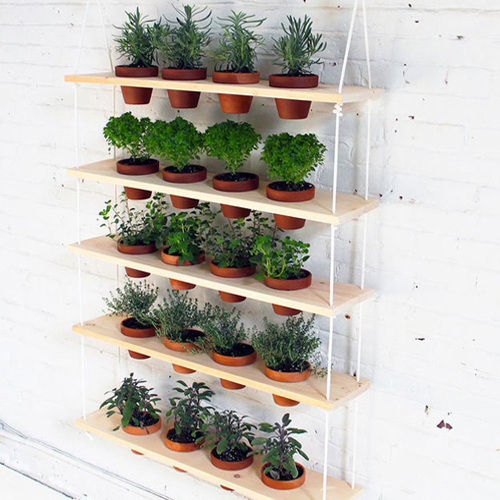 Either way we think this hanging vertical pot garden is a wonderful project for everyone.